In response to our previous eLetter [blog, journal], experts from UC Berkeley and Stanford replied with this. Below is our response. Our goal was to illustrate how what could be attained from one rooftop PV installation or isolated wind turbine are not representative of what can be expected at urban scales. We use energy and area data for the 10 most populous US cities to reinforce this point, comparing this back to power density (W/m2) estimates of wind and solar. They remain un-convinced, as do we. As their estimates are about 12-times higher than ours for solar PV and 70-times higher than ours for wind, somebody is wrong (and my bias is obvious). Below is a re-formatted version of the original. We challenged Kammen & Sunter  because their city-scale estimates were too high. Industrial-scale solar farms currently generate less than 20 We m-2 (Kammen & Sunter noted 10-120 We m-2) and city-scale wind farms could generate no more than about 1 We m-2 (Kammen & Sunter noted 2.5-30 We m-2). When compared to the ~28 W m-2 average consumption rate of the 10 most populous cities, the 29 W m-2 of Berkeley (CA), or the 47 W m-2of Cambridge (MA), hopefully our reason for forcing this debate is immediately clear. We are trying to establish practical estimates for city-integrated solar PV and wind. Reflecting on our debate thus far, we are converging on solar. The opposite is true for wind, where their revised estimate of 35 We m-2 is higher and therefore more wrong than before. Kammen & Sunter’s original manuscript  stated a solar PV range of 10-120 We m-2. We responded with observed solar farm data that was perhaps overly precise at 8.7-13.2 We m-2, as Sunter, Dabiri, and Kammen then responded with another observation that was just above our range. Solar farms on flat ground could hit 20 We m-2 in the very near-future, but the estimate is only part of the story here. We would be quite cautious in using any operational solar farm data as applicable to city-scales, as cities will exhibit complex shading considerations, more difficult operation and maintenance, and competing uses for land. We agree that if all surfaces (roads, buildings, parks) in the city were completely blanketed with solar PV that operate at a 40% efficiency, one could achieve 120 We m-2 in many locations. The math here is obvious, but incorporating such estimates into practical policy decisions is irrelevant. Reconfiguring a city to generate just the 20 We m-2 noted above should be recognized as a monumental challenge, even leveraging the recent drops in PV manufacturing costs. On wind, Kammen & Sunter  originally noted a range of 2.5-30 We m-2. We noted a range of 0.3-1.5 We m-2, to which Sunter, Dabiri, and Kammen responded with 35 We m-2. Figure 1. a) In red, mean average energy consumption rate in 2014, estimated by deriving an average per capita energy consumption rate for each state [13,14], scaling this to the city population, and dividing by the city’s area . The blue text shows the chronology of the estimated wind (blue) and solar PV (black) generation rates. b) Assuming the same climatology for all locations and the incoming kinetic energy flux is full available (no wind power deployed upwind), showing how our simple kinetic energy budget estimates a kinetic energy flux into the upwind edge of a city at more than 70 W/m-2 for very small depths (10-100s of meters) but drops to 2-3 W/m-2 at downwind depths typical of major US cities. Our assumption is that about half of the kinetic energy influx shown on the y-axis could be extracted for electricity generation. Such energetically consistent large-scale simulations, which include how the atmosphere will respond to wind turbines near the surface, formed the basis for our estimate of 0.3-1.5 We m-2 [4-9]. 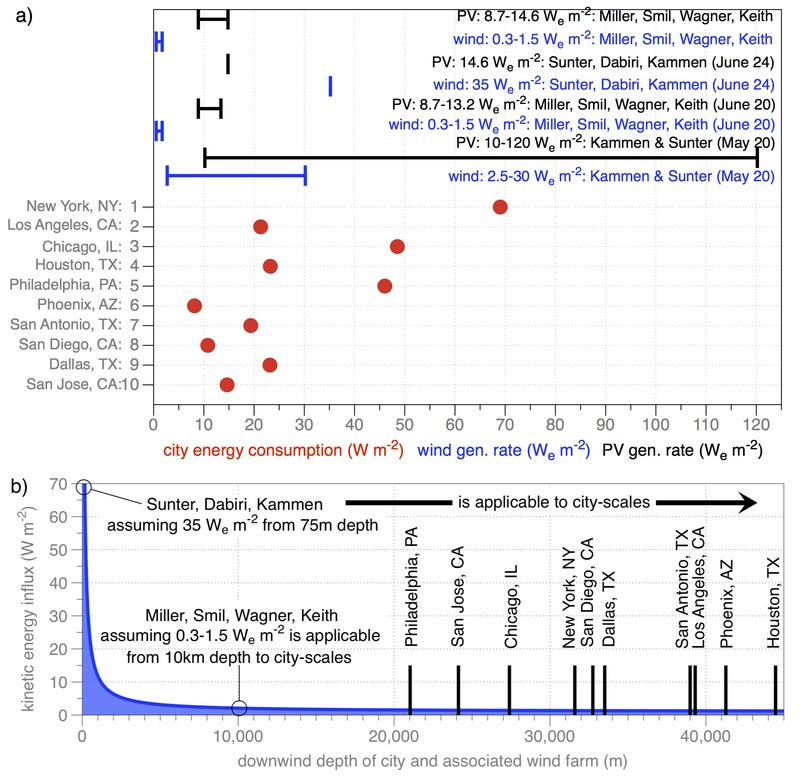 These results from various researchers show that large-scale energetics prevents generation rates of anywhere near 35 We m-2 from occurring at scales of 350-1600 km2, reflecting the areas of the 10 most populous cities in the US. There is no doubt that a single isolated turbine, or a line of turbines aligned perpendicular to the wind direction, could be influenced by a horizontal kinetic energy flux well over 70 W m-2, if one considers only the physical footprint of the wind turbines. For cities, while the kinetic energy entering the upwind boundary of the city could be quite large, many cities extend downwind for 20 to 40 km (Philadelphia, Houston). At this downwind edge, the downward kinetic energy flux maintains the winds. Cities with wind power would utilize this entire expanse, so how can we estimate their limit to large-scale wind power generation? The horizontal KE flux into the city is: 0.5•ρ(v^3)•H•W, where the air density is ρ=1.2 kg/m3, the wind speed v =5 m/s, the height is H ≈ 200m, and W is the width (m). The vertical flux downward into the city is ρ((u*)^2)•v•L•W, where the friction velocity of a city is about 0.5 m/s , and L is the downwind depth of the wind farm (m), referenced from the upwind boundary. Figure 1b shows how the kinetic energy flux changes with the downwind depth (assuming each city can be approximated as a circular area), including downwind extents of the 10 most populous US cities. Note the 70 W/m2 of kinetic energy entering the city at the upwind boundary – this could generate the 35 We m-2 noted in the previous eLetter response by Sunter, Dabiri, and Kammen. By 1km downwind, the kinetic energy influx has dropped to 10 W/m2, to 3 W/m2 at 5km downwind, and to 1.5 W/m2 by about 20 km. This 20km depth is approximately Philadelphia, the smallest of the 10 most populous US cities. This 1.5 W/m2 is also in agreement with long-standing energetics-based estimates on what maintains our present-day climate [11,12]. Assuming half of the kinetic energy could result in electricity generation, this simple approximation suggests that no more than about 1 We/m2 could be generated over the footprint of the city, regardless of the technology or their density.